Are you looking for the right camera to integrate into your embedded vision project? 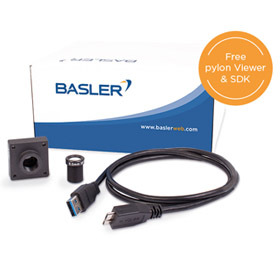 Basler makes your life easier with a plug and play evaluation kit for Basler’s dart USB cameras. System design engineers for imaging applications face an overwhelming range of options when choosing the right camera for their embedded vision project. If you’re currently in this situation, you know that finding the right camera and suitable accessories requires a lot of time and, thus, money. You can now shorten this process by using the Basler PowerPack dart USB for Evaluation, a plug and play evaluation kit including a Basler dart camera with a USB 3.0 interface, a suitable lens, a USB 3.0 cable, and pylon – Basler's industry-proven camera software suite. In combination with the pylon Viewer and SDK, the PowerPack is an easy-to-use kit that contains everything to get acquainted with a Basler dart board level camera: its size, features, and excellent image quality. In addition, the evaluation kit facilitates vision integration for a variety of embedded vision systems ranging from industrial to non-industrial applications.